Move to iOS app not working on Android phone to migrate data to your new iPhone? The app stuck on preparing/transferring process, dropped Wi-Fi or won’t connect to your iPhone. If you got these issues, this post may be helpful. Apple’s 2018 iPhone – iPhone XS and XS Max went on sale today. After getting the new iPhone XS, you may have tried using the Move to iOS app to get texts or other data from Android to the new iPhone, but the app may not working. Don’t be worried. 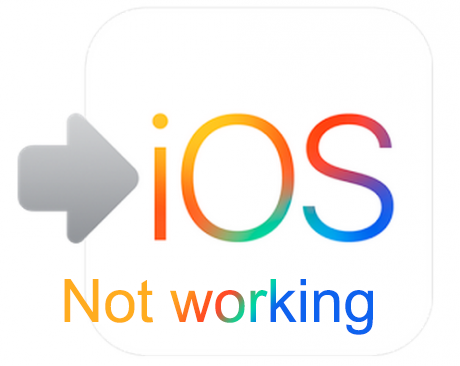 This post gives all new iPhone users the tips to fix these Move to iOS issues. And also the alternative ways to migrate data to new phone. Why Move to iOS Not Working? Move to iOS app is available on Google Play store for Android users to move data to their new bought iPhone device. And we’ve introduced this app before on how to transfer data from Samsung to iPhone. This app is nice because it is completely free. But in fact, the transferring process is not that simple. It requires a stable Wi-Fi network and may take a long time. As a result, this app got some bad reviews and has a only 3 stars ratings on Google Play store. So what issues you may meet while using Move to iOS to transfer data from Android to your new iPhone XS or iPhone XS Max? Pop up Error “Unable to migrate. Try again later”. Stuck at “Moving items into place…“, Stuck at 40% or 50%. Stuck at “Move to iOS stuck on preparing“. 2. Why Move to iOS Not Working? We tried to understand the issues from some discussions on SNSs and the bad reviews on Google Play. We found most of the problems were caused by the bad Wi-Fi network and the bad compatibility of this Move to iOS app. Besides, this app may not do something that people expected, such as transferring app data to new device. After going though all issues, we found Below we collected some tips from various forums to fix this issue you met when transfer data from Android to iPhone. And if the tips cannot solve what you have encountered, you can leave your problem on the comment section for a future solution. You should check the items in the below list before you use Move to iOS app. Move to iOS app requires Android 4.0 or higher. It cannot be used to transfer from iOS to Android. This app is only work with transferring data from Android to a New or Reset iPhone. Transferring may take you several hours, depends on the size of data you are migrating and the Wi-Fi network condition. Check network connection on both of your android and iOS phones. Check your android phone network settings and unselect the option for “Smart network switch” or something similar, such as Connections Optimizer. Or you can try to switch off your WiFi or switch between WiFi and mobile data on your android phone, which is said helpful to solve the issue of “Move to iOS could not communicate with device”. Turn your Android phone into airplane mode. Post Ratings: 3.7/5 stars - 7 votes in total. Hi, Emily. If all of these cannot help you. You can find some alternative ways. For example, Gmail contacts may be helpful to get contacts to your new iPhone. Or you can import your songs, pictures and other medias out to your pc and then sync these files to your new device. Or, you can download Android to iPhone transfer tool, Good luck! I managed to get them connected and to get the transfer started. But, it stops at 29%, nothing happens after that. What could be the problem? I also got this issue, move to ios preparing, but no response at all. what to do with this? Stuck at 36% forever now. Anyone find a solution? I am running into same problem as Stephanie, stops at 45% and appears to be stuck there for long amount of time. What could be the issue? I am moving from 16GB to 128GB. It kept failing at enter passcode but finally got past that with the airplane mode, now I’m stuck at preparing for 10 mins is that normal? Yeah, it’s normal, and it may takes you hours to finish transferring. LG V20 current OS. Iphone 7 plus. Tried whilst charging and fully charged. Insured devices are not more than several inches apart. Any applications i could use on my PC that are reliable, there are so many out there. I cannot loose the text messages from my Son. I’m facing the same issue. If push comes to shove, I would suggest downloading an app on Android to back up your text messages. There are some that save the content in a folder in our Gmail. Good luck! I am stuck at move from android page whereby I need to download move to ios app. I can’t get past this page n am stuck n not able to use my phone. What can I do? Airplane mode finally helped kick off the transfer but while cleaning up pics and bids during transfer it stated the ‘transfer was interrupted ‘ :-(. Starting over. Still slow going back to 33%. Thank you for this: It seems to be working! I’ve turned the airplane mode but I keep getting the unable to migrate error after 2 minutes. My Huawei Mate SE pop ups with “this wifi can’t access the internet, do you want to switch” but I cancel it. I have turned off wifi+ which is the connections optimizer. I’ve also restarted the two phones. I’ve tried on different wifi networks as well. The phones are always plugged in- with nothing else on the android but it still won’t. Any tips or suggestions? Keep getting error: move to ios could not communicate with device, while trying to move photos from my htc to new iphone xs. tried lots of methods but failed. Finally, go to my android settings > connections > more network > mobile networks > under connection optimizer, I unchecked and then the connection worked. Move to Android doesn’t even show up as an option during setup, how do I get that to appear?? Also got this problem that no “Move Data from Android” option when set my new iphone, I checked the wifi network, and was sure the app correct run on my old sumsang.